Weekend finally, though it last only for 2 days, the rest of the 5 days are spent expecting it!!! :) Philosophy, a plate of poha can make you talk like this, wondering!! I get into weekend mood on Wednesday itself, it is like ahh only one day and then it is Friday. All this drama is just to catch couple of extra hours of sleep in the morning. Yes, the thought not waking up early at 5, running around like a headless chicken thinking what to do next, where every running minute is precious brings, such a happiness and peace to my mind. I m sure many would agree with me on this. So, now what to make for such relaxed mornings. 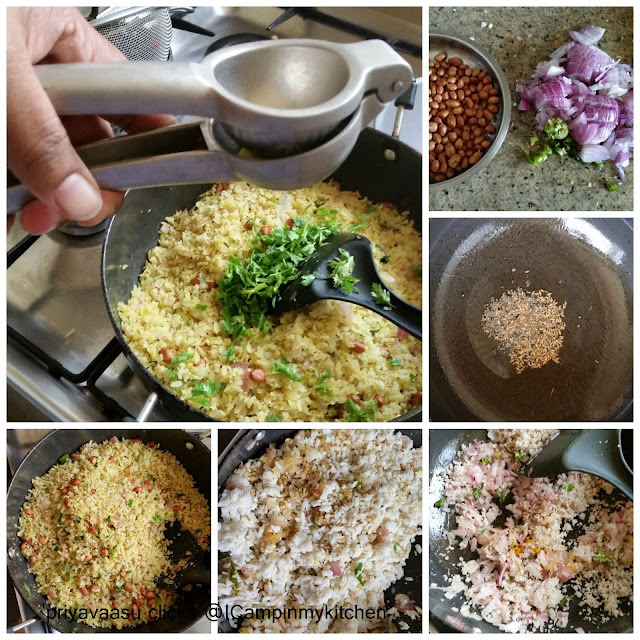 you can either make an elaborate breakfast like Dhuska and chutney, IDiyappam-Stew, or Thepla-batanu shaak or settle for a simple, quick and easy to make Kanda poha. I normally go for elaborate breakfast on weekends and keep this simple and easy for weekdays. But today i changed plans and made a quick breakfast and prepping for an quick lunch too. This Maharastrian staple is not only a popular breakfast, but heard from my sister, it is also a popular street food served during morning rush hours near stations and offices along with sheera and upma, If u are in a hurry, just grab a plate of it and relish it on the go!! Take poha in a colander and wash it under running water for a minute. It will turn soft. Let it sit on the counter until use. In a wide pan,add a drop of oil and fry the peanuts until crisp. ake i off he stove and keep aside until use. Chop onions and green chilies finely. Heat a wide pan with oil, crackle mustard and cumin, add asafoetida and curry leaf. Next add chopped onions and green chilies along with turmeric powder.Saute until onions turn translucent. Next add grated coconut and followed by poha, add salt and mix well. Let this cook for 2 minutes for the flavors to mingle. Now add roasted peanuts and coriander leaves. Finish it off with lemon juice, take it of the stove. Serve hot with a wedge of lemon and some boondi/sev garnished on top. This was a common breakfast when we were growing up and even my MIL use to make it very often. This is indeed a quick, easy and yummy breakfast. This is one comforting and easy to prepare breakfast .I like to make it on weekends with a promise to make an elaborate feast for lunch. Such a hearty, comforting breakfast, lovely poha dish, my all time favourite. Any version of aval upma is welcome for me. Not so with my family :( Love it . Priya, we run on the same philosophy!..hehehe..for two days we spend the all 5 days looking fwd!..beautiful bowl of Poha, your composition rocks! Aval is my fav ingredients.. i love in any form..Well made and wonderful clicks. Yum.. 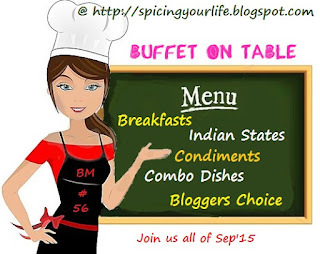 This is in my list for breakfast week. A simple dish but presented like a real rustic gourmet food...lovely clicks. This is a regular in my place. In fact if I am not careful we are going to have a ban on poha. :D Love yours but. Loved your write up. Even I yearn for the extra sleep got during weekends. Poha looks so yum.